India's startling first-round exit at the last World Cup is still regarded as one of the greatest shocks in cricket and a fired-up Virender Sehwag wants to make Bangladesh pay for eliminating them four years ago. "We know... we lost against them and we have been waiting for the moment when we will play against them in this World Cup," opener Sehwag told reporters ahead of Saturday's showdown when the two co-hosts clash in the opening match of this year's event. On paper, a repeat of Bangladesh's 2007 heroics in the Caribbean, when they shot India out for 191 and then successfully chased it down, looks a bit unlikely this time round. India, considered by most cricket pundits as one of the favourites to win the showpiece event, are a balanced outfit. They boast a strong batting order, with Sachin Tendulkar and Sehwag at the top, and a solid middle-order to follow. In captain Mahendra Singh Dhoni and Yusuf Pathan they have two explosive late-order batsmen who can change the complexion of a game in a few overs. "I think so far we have lost just one or two games against Bangladesh -- one in the World Cup and may be one in Bangladesh," Sehwag oozed confidence. "So our record against Bangladesh is very good." 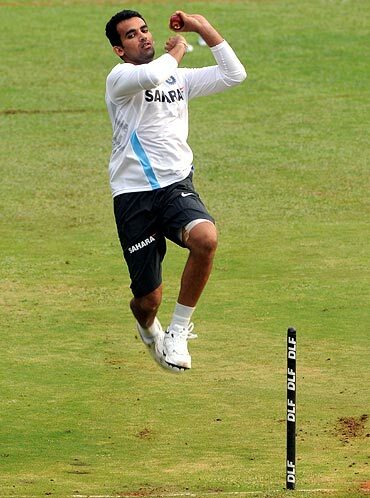 Doubts still remain with the Indian pace attack though, with the wily Zaheer Khan always susceptible to fitness worries. The Indian spin department, however, looks formidable. Led by the feisty off-spinner Harbhajan Singh, they showed how dangerous they could be during the warm-up games against Australia and New Zealand. Bangladesh will miss paceman Mashrafe Mortaza, whose omission from the squad due to a knee injury sparked three days of protests in his hometown last month. Mortaza was the tormentor-in-chief with four wickets for 38 when Bangladesh beat India by five wickets in the 2007 World Cup. Conditions in the subcontinent have always favoured the slow bowlers and it is little wonder that both India and their neighbours thrive on their part-time spin options for breakthroughs. Bangladesh have a potent spin attack in their captain Shakib Al Hasan, who was ranked as the world's number one all-rounder in ODIs in 2009, and Abdur Razzak. They also boast of a handful of part-time spinners, like their Indian counterparts, who make it difficult for batsmen to score during the middle overs. The Indians, who go into Saturday's match after two comprehensive victories against Australia and New Zealand in the warm-up games, will have to rein in a very confident Bangladesh outfit. The Bangladeshis, having won seven out of their last eight matches at home, are brimming with self-belief. 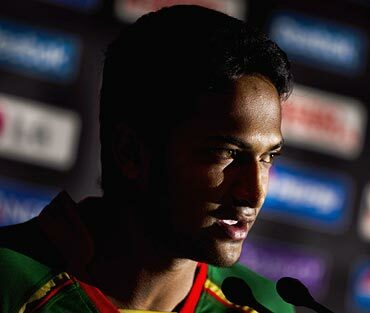 "We have been playing good cricket for the last 15 months, and if we qualify for the second round, why not think of something big," captain Shakib told reporters. "We have to win at least four matches to win a place in the second round. It is not difficult. "I think we are capable of booking a place in the second round."